After a long silence, Senator Antonio Trillanes known critic of Duterte comes out with a bang while President Duterte is in a state visit in Israel. 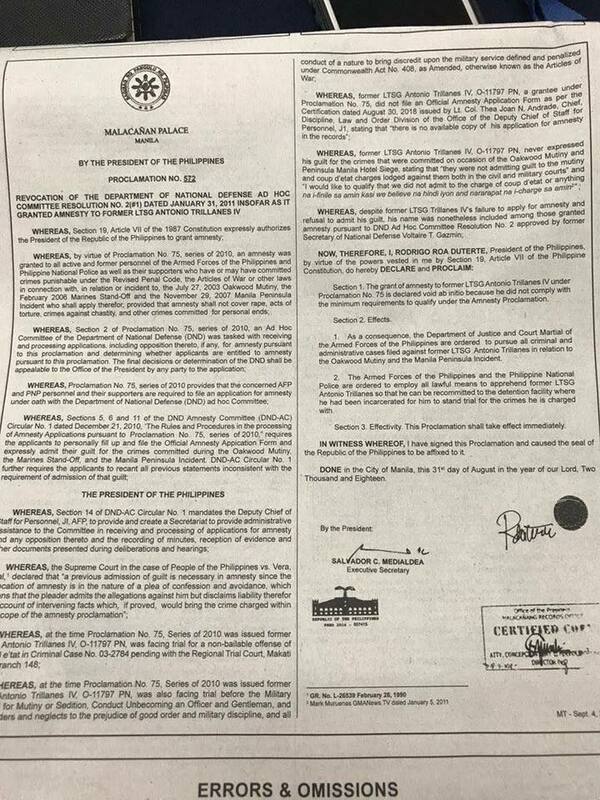 On Tuesday, Justice Secretary Menardo Guevarra confirmed to the media that President Rodrigo Duterte has revoked the amnesty given to opposition Senator Antonio Trillanes IV in 2010 in connection with his involvement in unsuccessful attempts to overthrow the Arroyo administration. Signed by Duterte on August 31, 2018, Proclamation No. 572 stated that the amnesty extended to Trillanes was void from the start because he did not comply with the "minimum requirements to qualify under the amnesty proclamation." 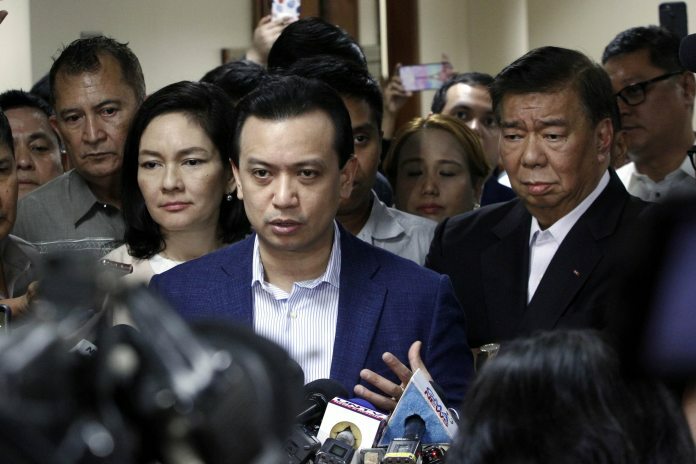 The authorities were spotted hours after President Rodrigo Duterte nullified the amnesty received by Senator Antonio Trillanes in 2010 that freed him from being detained. The Senator might spend a week inside the Senate building to avoid arrest. 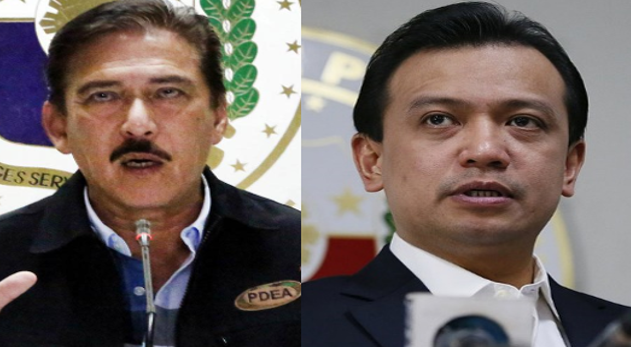 Senate President Tito Sotto made a decision that none of his colleagues will be arrested, Trillanes needs to stay in the Senate premises to avoid arrest. “Sa akin kasi, hindi yung pagsa-subject dito sa arrest kasi nakulong naman ako before at hindi naman sa hinahanap-hanap ko ‘yan, but it’s something na hindi ko aatrasan,” he told reporters. “What we are questioning is the principle behind it. This is a warrantless arrest so we need to fight this,” he said. "Ang assurance ni Senate President, as long as nandito ako sa Senate premises he will not allow any arrest." Trillanes added. Trillanes also criticize the decision of President Duterte and said that Duterte is the first president in history to revoke an amnesty. “Ito, gumagawa sila, binabaluktot nila ang batas para lang magawa nila yung kanilang political objective, which is to persecute the political opposition,” he said. 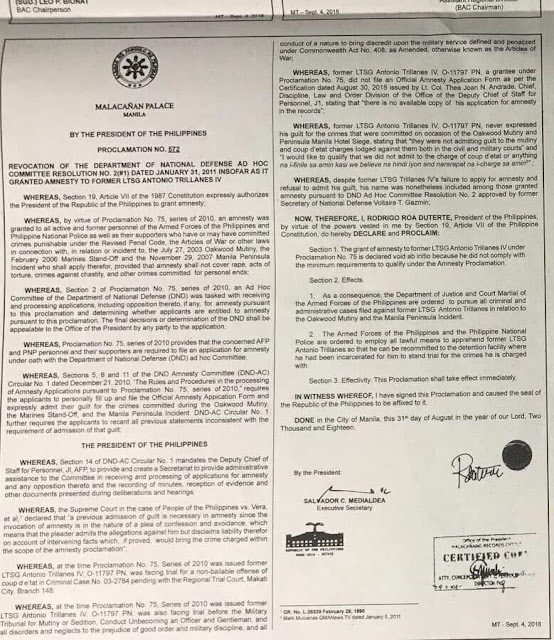 Senator Trillanes already asked his lawyers to file a petition at the supreme court to prove that the proclamation filed by Duterte against him is illegal.